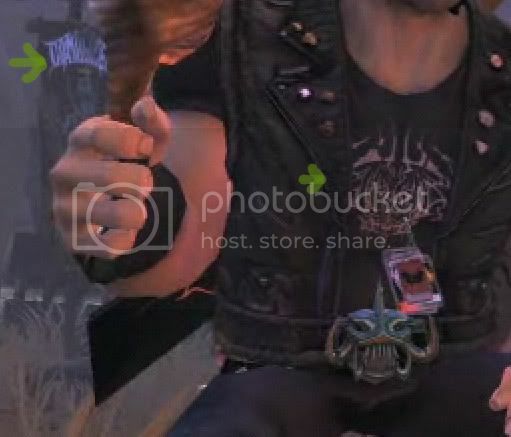 Spike TV is airing a new Brutal Legend video tonight during their pre-show E3 programme. You can see a small preview of the show on the Spike TV website, although nothing to do with Brutal Legend is shown — you’ll have to wait until the actual show for that. The programme begins at 11pm tonight. It’s not clear which time zone that actually is, so if you’re in the US simply consult your TV schedule. If you’re in Europe, you’ll probably be in bed when it airs! Due to Spike TV’s relationship with GameTrailers the video will almost certainly appear on there afterwards, so I’ll update this post with the video once it’s available. [May 29th, 2009 at 9:25am GMT+1] As expected the video is now available on GameTrailers. It’s actually a minute from one of the game’s early cutscenes rather than a trailer, so depending on your sensitivity to spoilers you may or may not want to give it a miss. Was a neat trailer, glad we got to see a bit of story instead of all out action. The music in the background is what really amazed me. It took me a couple of viewings to notice it simply because of how subtle it was. The cords were of something I have heard before having an air of familiarity so it may be a clue to another band in the game, or to a new character. If it is Peter he is at a new level of greatness then he has done with Grim Fandago(personal favorite of mine for music). Blending in so well while enjoyable on its own. Truely the rock gods have blessed this game, and it shall rock..
Yeah, that definitely sounds like some sweet work from McConnell. Had a bit of a Full Throttle feel to it initially! I just noticed that the t-shirt Eddie wears is the same design as a flag behind him. Could be, but it also could be a clue to something else. I am unsure of it myself, clues never look like clues when looked at. That is why I think it is a clue of some short.Tim did say, “I can’t tell you what Eddie’s shirt says! It’s an important plot point. That would be a metal spoiler.”(Source crispygame ) That is why I think it is a clue of some short. I dont think the picture on his shirt is the same as the flag in the background. The picture on his shirt has a design that goes down further in the middle then the one on the flag. Of course it is hard to tell from the distance the flag is at.